America’s four-decade-long experiment with mass incarceration and overcriminalization is widely recognized as a failure. We lock up a greater share of our citizens than any other developed nation, destroying lives and separating families at an annual cost of more than $80 billion. In addition, we do little to prepare individuals behind bars for their eventual release, yet are surprised when some two-thirds return to our jails and prisons. The crushing impact of the criminal justice system’s failure is felt acutely in communities across the United States. Significant and growing research shows how certain populations—including communities of color; residents of high-poverty neighborhoods; and lesbian, gay, bisexual, and transgender, or LGBT, individuals—have been particularly hard hit. But rarely discussed is the impact of the criminal justice system on Americans with disabilities. 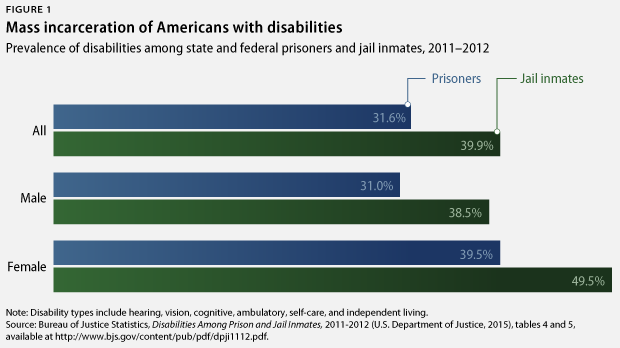 People with disabilities are thus dramatically overrepresented in the nation’s prisons and jails today. According to the Bureau of Justice Statistics, people behind bars in state and federal prisons are nearly three times as likely to report having a disability as the nonincarcerated population, while those in jails are more than four times as likely. Cognitive disabilities—such as Down syndrome, autism, dementia, intellectual disabilities, and learning disorders—are among the most commonly reported: Prison inmates are four times as likely and jail inmates more than six times as likely to report a cognitive disability than the general population. People with mental health conditions comprise a large proportion of those behind bars, as well. The Bureau of Justice Statistics reports that fully 1 in 5 prison inmates have a serious mental illness. 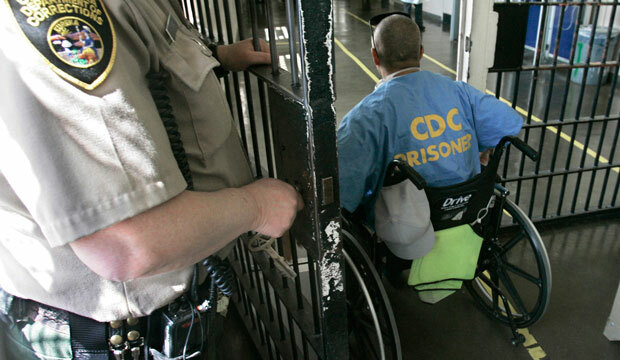 Mass incarceration of people with disabilities is unjust, unethical, and cruel. But it is also penny-wise and pound-foolish, as community-based treatment and prevention services cost far less than housing an individual behind bars. According to a 2014 study of Los Angeles County, the average cost of jailing an individual with serious mental illness exceeds $48,500 per year. By comparison, the price tag for providing Assertive Community Treatment, or ACT, and supportive housing—one of the most intensive, comprehensive, and successful intervention models in use today—amounts to less than $20,500 annually, just two-fifths the cost of jail. In addition to facing disproportionate rates of incarceration, people with disabilities are also especially likely to be the victims of police violence. Freddie Gray, Eric Garner, Kristiana Coignard, and Robert Ethan Saylor were all individuals with disabilities whose tragic stories of being killed at the hands of police officers garnered significant recent national media attention. They are but four high-profile examples of a widespread, commonplace occurrence. While data on police-involved killings are extremely limited, one study by the Ruderman Family Foundation estimates that people with disabilities comprise a staggering one-third to one-half of all individuals killed by law enforcement. According to an investigation by The Washington Post, one-quarter of the individuals shot to death by police officers in 2015 were people with mental health conditions. Countless more have suffered brutality and violent treatment at the hands of police, often stemming from misunderstandings related to mental health conditions and other disabilities. Furthermore, the number of individuals who have acquired disabilities while in police custody is unknown. While behind bars, people with disabilities are often deprived of necessary medical care, as well as needed supports, services, and accommodations. This is despite long-standing federal disability rights laws that mandate equal access to programs, services, and activities for all people with disabilities in custody. Poor conditions in jails and prisons and inadequate access to health care and mental health treatment can not only exacerbate existing conditions, but also lead to further physical and mental health problems that individuals did not have prior to incarceration. Many inmates with disabilities are held in solitary confinement—reportedly, in many cases, for their own protection, due to a lack of appropriate alternative accommodations. A growing array of research reveals that even short stays in solitary confinement can have severe and long-lasting consequences for people with disabilities, and particularly those with mental health conditions. Furthermore, many individuals who had not previously lived with mental health conditions experience significant psychological distress following solitary confinement. The tragic but all-too-common case of Kalief Browder brought this to light last year. Browder died by suicide after nearly two years in solitary confinement in Rikers Island on charges, later dismissed, that he had stolen a backpack. This report highlights steps policymakers can take to combat inappropriate and unjust incarceration and criminalization of people with disabilities, as well as steps to ensure appropriate and humane treatment of people with disabilities throughout the justice system, from police practices to courts, conditions in jails and prisons, and reentry. Rebecca Vallas is the Managing Director of the Poverty to Prosperity Program at the Center for American Progress.